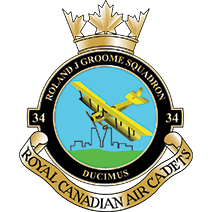 Air Cadet Training is divided into five proficiency levels, including on-the-job training for senior cadets. Some of the classes offered to Air Cadets at the local level aeronautical facilities, aircraft identification, aircrew survival, airframe structure, citizenship, drill, effective speaking, general cadet knowledge, physical fitness, sensible living, marksmanship, principles of flight, propulsion, radio communication, instructional techniques, leadership, navigation, and meteorology. Every Monday night is a mandatory Parade Night. 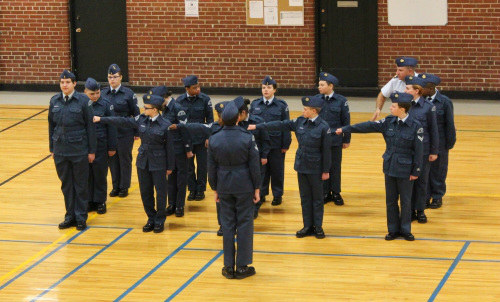 On those nights, cadets learn drill and take fun classes on: citizenship, leadership, instructional techniques, aircraft, aerodrome operations, and how to be a good cadet. Occasionally, there will be opportunities to go to the Range and shoot air rifles, and chances to fly the simulator we have at the squadron. Training starts at 18:25 (6:25PM) and goes until 21:30 (9:30PM). In addition to the regular training, there are also additional activities that you can take part of. Most of these activities are held on Sunday nights. You can view them on the Programs page.